(Photo: Ecumenical News / Peter Kenny)Lutheran World Federation general secretary, Rev. 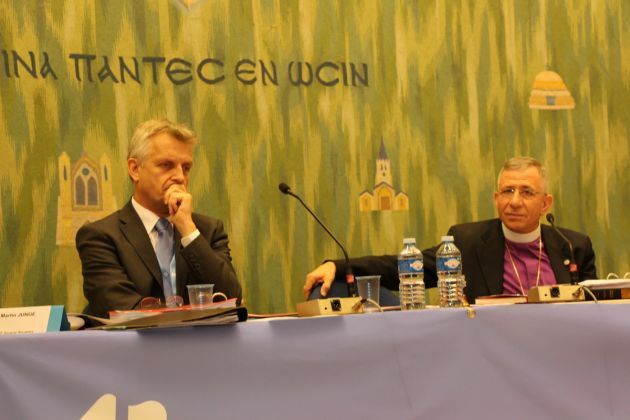 Martin Junge (L) and LWF president, Bishop Munib A. Younan during a governing body meeting in Geneva, Switzerland on June 13, 2013. The Lutheran World Federation has expressed deep concern over a Court of Appeal ruling in Malaysia, forbidding a Roman Catholic publication from using the Malay-language word "Allah" for God. The Lutheran leaders said the decision could lead to confusion, resentment and discord. In January Christians in Malaysia had said they would not observe the ban on using the word "Allah", imposed by a decree of the Sultan of Selangor state. In January 10 statement sent to Fides Agency, the Christian Federation of Malaysia reiterated its "constitutional right" to call its God with the term "Allah". It noted that "Allah is the Arabic word used by all the Christian communities of Bahasa Malaysia language," citing the Christians of ethnic groups Orang Asli, Baba, Christians who live in the provinces of Saba and Sarawak, as well as all those who live in the Malaysia peninsular. For their part the Lutheran leaders noted that the ruling, "Violates the freedom of religion and freedom of expression of Christians in Malaysia; and threatens to create unnecessary division and discord between Christians and Muslims in Malaysia." Younan is a Palestinian based in Jerusalem who works closely with inter-faith bodies the region and Israel. In an October 14 ruling, the Court of Appeal of Malaysia upheld that the Roman Catholic weekly Herald newspaper must refrain from using the word "Allah" in its publication and that a ministerial decree did not infringe on the newspaper's constitutional rights. In their letter to the Malaysian churches, Younan and Junge noted that Christians have been using the word "Allah" for more than 2,000 years. "If Malay-speaking Christians would be forbidden to address God as 'Allah,' then their teaching, practice, worship and observance would no longer be free," they noted in the letter. It was sent to the leaders of the Evangelical Lutheran Church in Malaysia, Basel Christian Church of Malaysia, Protestant Church in Sabah and the Lutheran Church in Malaysia and Singapore. Younan and Junge pointed out that the very fundamental rights of freedom of religion and expression that are enshrined in the Universal Declaration of Human Rights are also applicable in the Constitution and laws of Malaysia. As the right to hold opinions without interference is integral to freedom of opinion and expression, the court's "ruling interferes with the opinions of the Malay-speaking Christians, and with their actual practice," the LWF leaders noted. "While religious intolerance is a source of violence and suffering, religious freedom provides a source and basis for peaceful co-existence," the Lutheran leaders said, referring to observations by the LWF's main governing body, its council at its June meeting. In a 2011 visit to Malaysia, Younan and Junge met with Malaysian government officials and discussed the need to promote interreligious and interethnic understanding and cooperation through dialogue in order to further unity in diversity in the country.